This is an HTML version of the 1976 MiniSail Yearbook. As yet it's incomplete, but hopefully, I'll manage to get more done bit by bit. The idea is that this should be instantly visible - and searchable! Like all first time events, there is no forerunner from which to seek guidance as to the most suitable layout, format and general requirements. To ensure the publication and information contained therein will suit and satisfy the vagaries of the most discerning reader, it can only be hoped that we have managed to cater for all the varying requirements of the membership from those requiring guidance on sailing generally, to those wishing more advanced information on such subjects as sliding seat technique; not forgetting of course those who just wish to potter to obtain their pleasure in sailing. There is no doubt that we in the Minisail Class Association can justly lay claim to a first class, exhilarating and truly satisfying boat. Our image in the sailing world is continually improving and it is difficult to think of a name more widely known than “Minisail”. 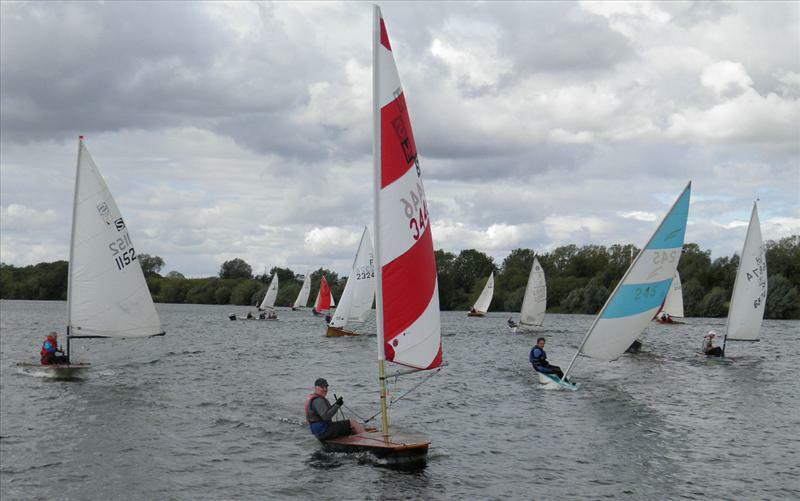 I hope that during 1976 we will all sail seriously and race within the spirit of the rules so that others looking on will have no doubt as to the spirit which we engender, and why we can lay claim to being recognised as a leading class in the dinghy world. Today's economic situation means that Class Associations will be stretched to the limit financially. In order for us to obtain maximum enjoyment from our activities a small nucleus of your colleagues spend much of their spare time planning and arranging the Association's activities. The only reward they seek is that you attend, enjoy and make a success of their efforts. Please make sure all your Minisailing friends are members of the Association. My thanks to all those who participated and worked hard to produce the Year Book. I look forward during 1976 to seeing as many members in action as possible and to hearing your views on how we can best further your interests. I wish you all good sailing and an enjoyable season. Appropriately I am beginning with an editorial apology for not producing this handbook on time. Sorry to one and all. The legion of entirely credible excuses I can muster in my defence will only add irrelevance to what I feel is an important step towards the expansion of the Minisail class in general. Over the years we have not lacked enthusiasm and a will to sail and race, but we may have suffered from a significant lack of self-confidence to develop along the lines of other more well known and successful classes. The production of this booklet can only help to pull us together as a group and progress. 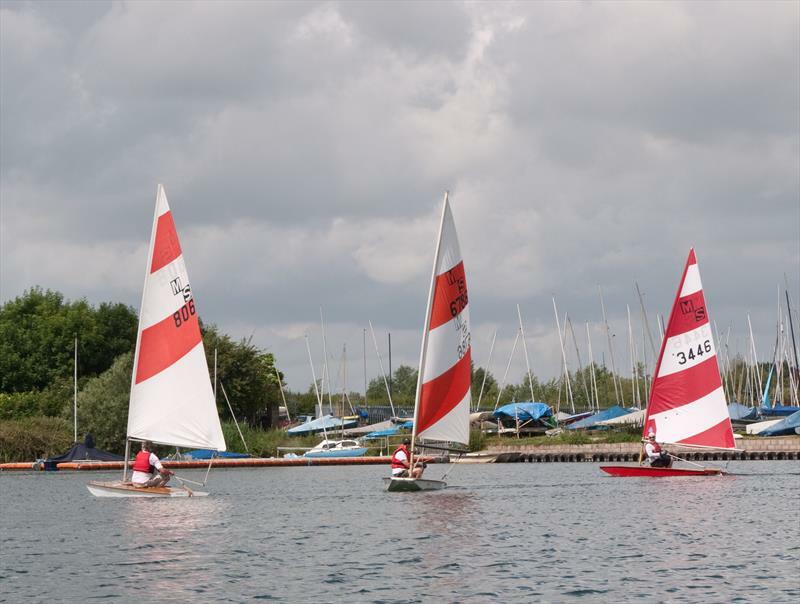 It provides information on a number of important levels for the novice and experienced sailor alike. In particular I would draw your attention to the names and addresses of members, and urge you to come out of your isolation and get to know each other either by direct contact or by coming to open meetings and championships. To those who wrote articles many thanks. There are omissions and areas which could have been expanded more fully but no doubt these may be rectified in next year's handbook when the new editor will, I am sure, enjoy even more co-operation from the Association members. As an idea, the Minisail is not original. It was two Americans who first had the idea of putting a sail on a surfboard. Their boat was called the Sailfish and their company, Alcort, became one of the largest small boat companies in the USA. It was in 1959 when Ian Proctor, as a yachting correspondent for the Daily Telegraph, was in the USA to report the Sceptre America's Cup series that the idea of an English Minisail was born. I was then working for Westinghouse Electrical International Corporation in New York and Ian and I spent quite a lot of time together. I said that we should have a Sailfish in England, and he said he would design one. Not much happened for some time after I returned to the UK to rejoin General Electric Company but, at the end of 1960, Ian telephoned me to say that he had completed the design and would prefer to have the prototype built by Chippendale who was conveniently to hand at Emsworth. 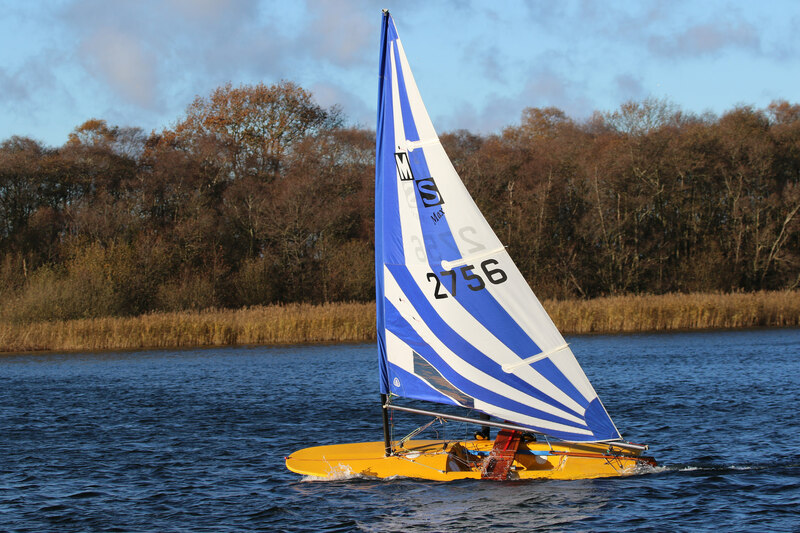 I remember the sensation of sailing the prototype with its rapid acceleration was very different to sailing any other dinghy. Chippendale was very enthusiastic and wanted to produce Minisails and eventually three builders, Chippendale, Bossom's Boatyard at Oxford and Plycraft in Somerset were licensed to produce the first Minisails which were not only timber built with the same hull shape as the existing fibreglass Minisail but they had flat decks and no cockpit. By 1962, Chippendale, Bossoms and Plycraft dropped out of the picture and by 1963 the first fibreglass boats were produced. Eight were presented to HMS Devonshire, a guided missile cruiser, and described as the “finest piece of sports equipment the ship had ever had”. Philip Saul and I had fitted the plank from his daughter's see-saw across the deck of his boat and the first non-sliding seat was born. I remember being overtaken by a Flying Dutchman but that the difference in speed was not as much as the latter boat would have liked! 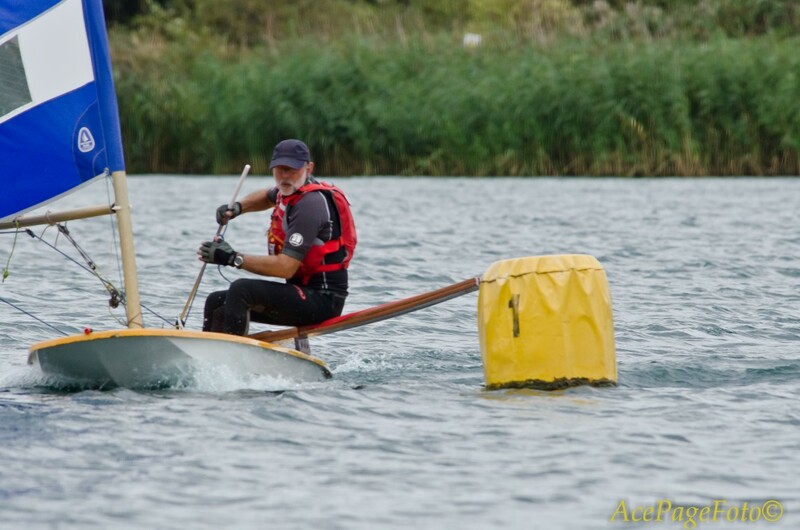 The first championship race was held at Canvey Island and we had great difficulty getting our daggerboards unstuck from Canvey Island's special variety of mud. At a meeting, the Class Association was formed with Philip Saul as Hon. 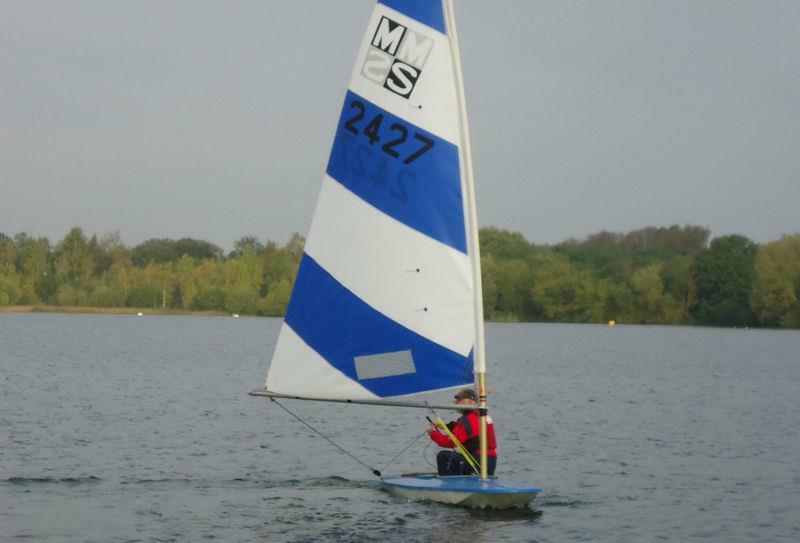 Secretary, but the Minisail had not really penetrated any sailing clubs – for one thing single-handed sailing was not particularly popular and the Minisail itself was, of course, originally designed for two people. 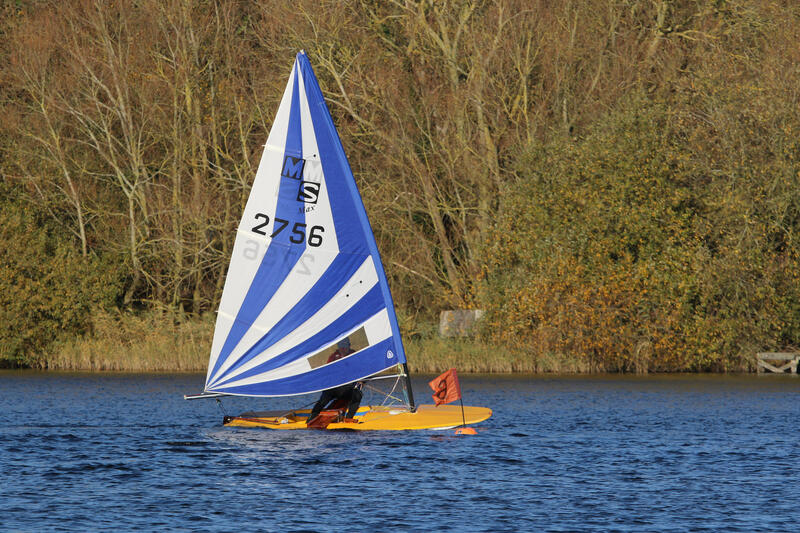 In its standard form it is still sold as a boat fro one or two people and an excellent fun boat it is. 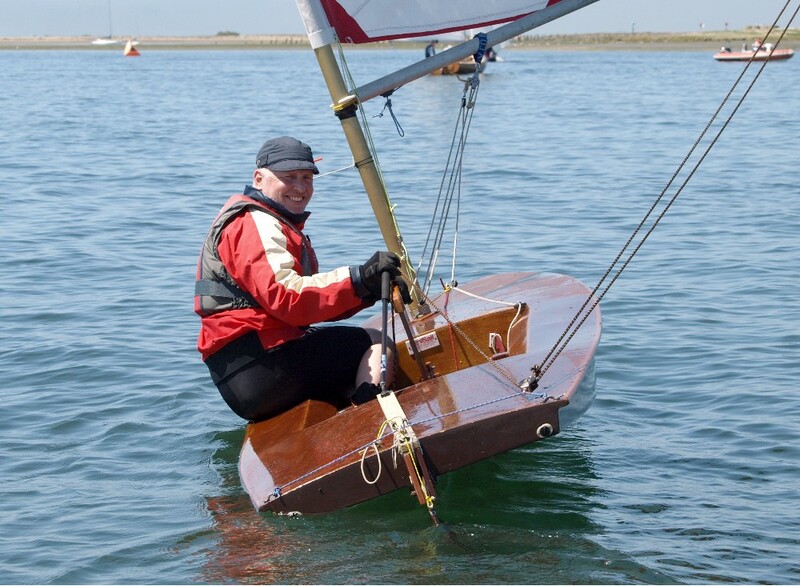 The point of Philip Saul's seat was that he found sailing it single-handed, he needed more power to sit it up in Thames Estuary conditions. Perhaps it was because the boat was such fun sailing single-handed in a breeze that people did not have to race it in order to get pleasure. It was in December 1973 that a small band of Minisail brothers, notably John Burgess, descended on a Richmond Marine standard Minisail and turned it into what was known as the MiniSprint Mk1 – with a stiff boom and tuned rig. Apart from the tracked boom, the tuning was what had become standard in the Class but the availability of a standard Minisail ready to race was obviously appreciated. MiniSprint Mk1 did sufficiently well that in 1974 Ian Proctor was asked to produce an entirely new deck arrangement on the MiniSprint Mk1 for single-handed racing only. 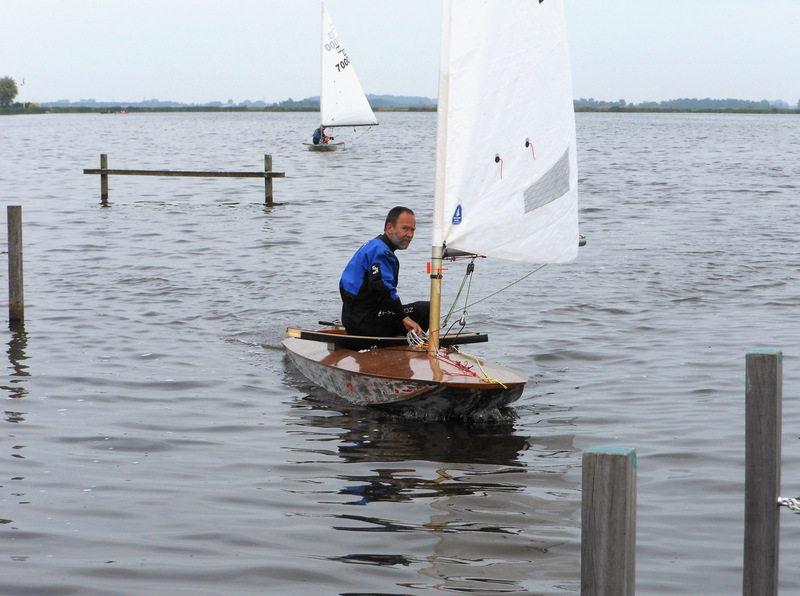 Freeboard was increased to eliminate drag of the sliding seat and steps were retracted by making the rear deck self draining again – although the configuration was completely different from that of the original MiniSail. 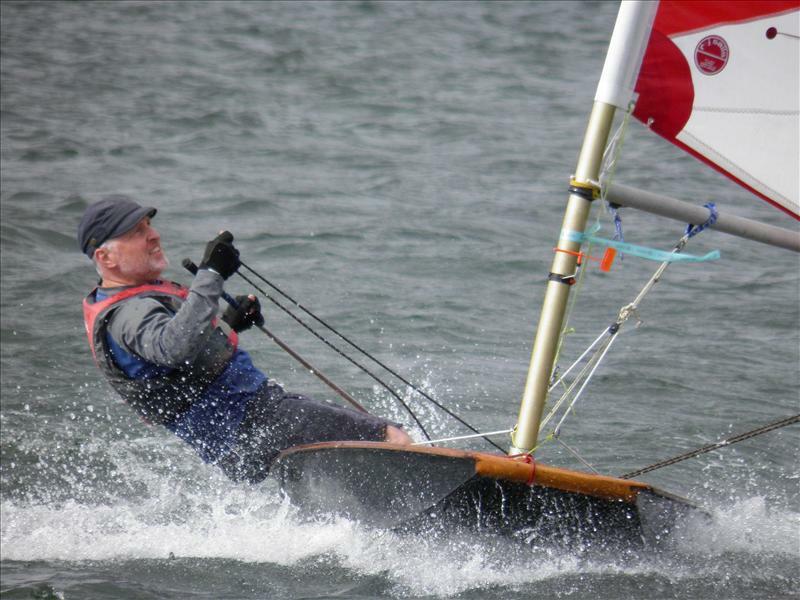 An integral bridge deck for the sliding seat was built in to keep weight down and a change in the Class rules permitted the use of a centreboard. The opportunity was taken to correct some hollows and concavities that had crept into the MiniSail hull and the new boat was a great success at the 1975 Boat Show. It would be interesting to place a MiniSprint Mk11 alongside the original MiniSail and to see the extent to which Ian Proctor's various MiniSail designs have almost gone round in a circle. Each one of them has filled a need at a particular time and, in this writer's view, each one is a design classic – perfect both visually and in function. 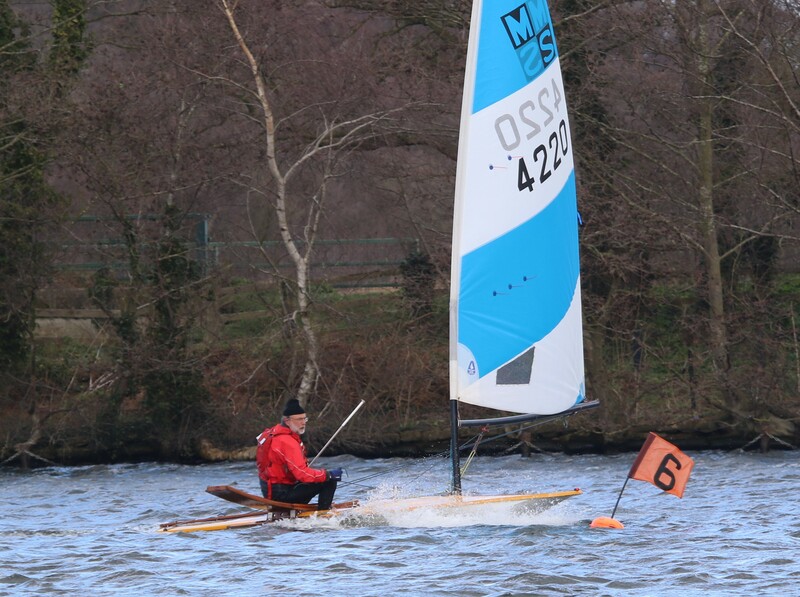 We can certainly see no reason now to make any changes from the existing glassfibre MiniSail as a sporting fun boat or from the MiniSprint Mk11 as an out and out single-handed racing dinghy for serious competition. Always have suitable personal bouyancy aids. 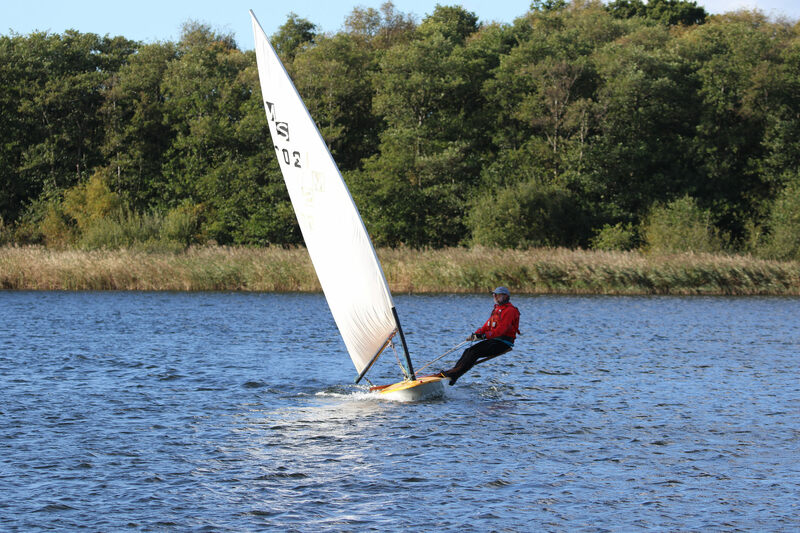 If you sail on open water or during the winter a wet suit is strongly recommended. 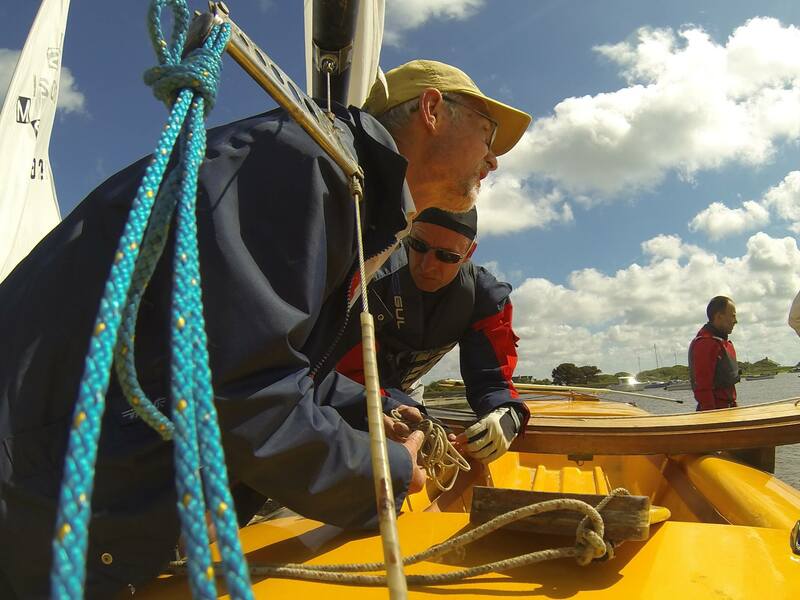 Get measured by an approved RYA or class association measurer. Forms are available from the Hon. Sec. Be a member of the MiniSail Association and always have your members card and measurement endorsement (on the card) with you when you attend an open meeting. Do not be afraid to seek advice on any point from others with more experience. Try to gradually increase your knowledge of the racing rules by studying a good sailing text. 'Dinghy Team Racing' - Eric Twiname – Adlard Coles Ltd. Unless you … clubs and some experience, it may be … to consult one of the committee by phone as to the wisdom of your proposed buy. There are traps to fall into which can be easily avoided through a word with someone who knows. (1959) Wood flush deck – only a few now in existence – not available new. good in the sea – not available new. 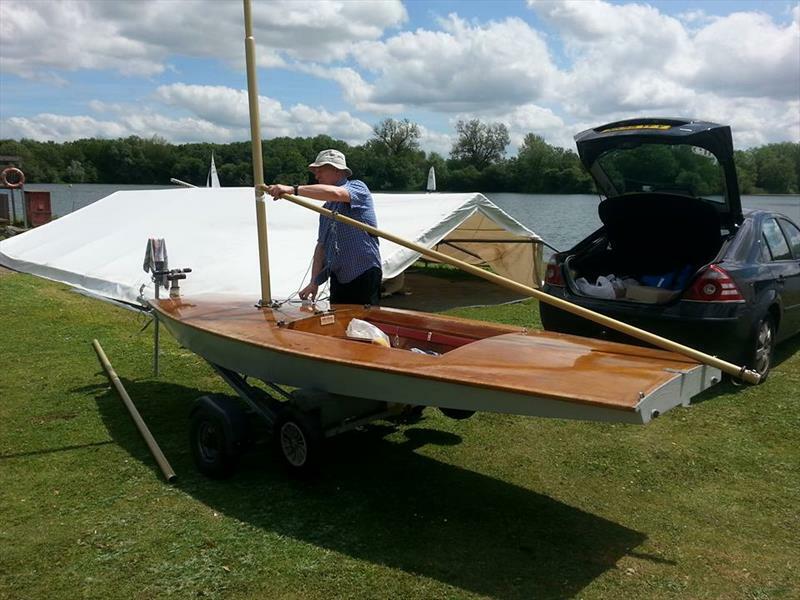 (Middle Sixties) Wood flush deck – platen bottom – the 'original flying punt' – available second hand plans available from Richmond Marine for home construction. (1975) as Sprint II in grp hull design and drop centre board slot but with flush deck, optional sail plan. The deck is of wood. Available complete with … wing. Members are strongly recommended to join a club where there is … and to seek the advice of those who have some experience. Although the boat is in many ways simple, getting the most out of it requires some help in the initial stages especially if you have a basic MiniSail. It is worth pointing out that in spite of the varieties of design we have sailing no type has established itself outright as being superior. 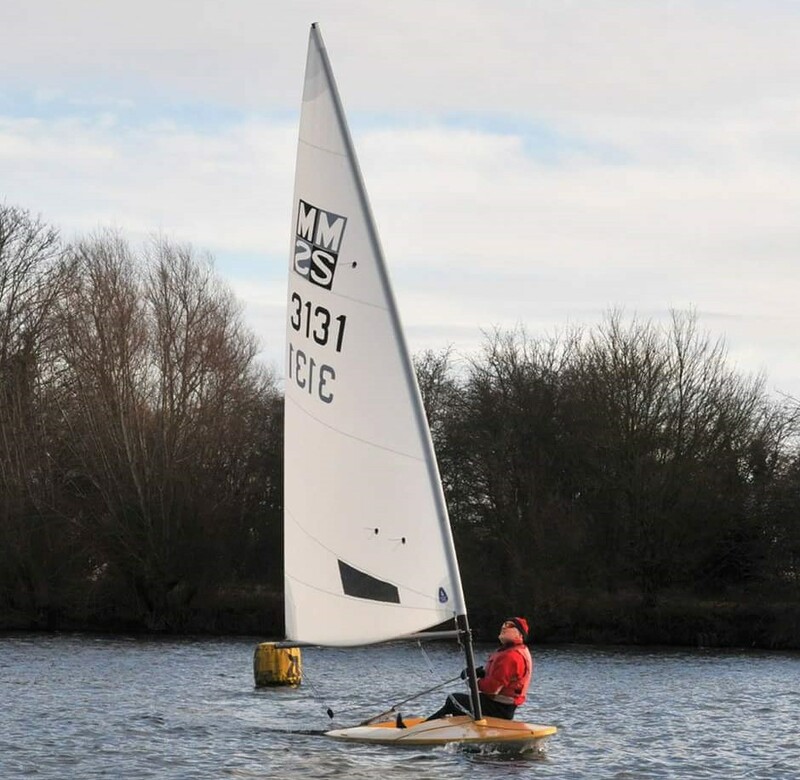 The basic boat with suitable alterations is potentially as good as any of the more flash varieties but it will mean extra outlay on sails, blocks, etc. When asked to write an article of not less than 750 words about the MiniSail deck layout and rigging I wondered how I could say so many words about a basic simple boat like the MiniSail (but who said simple). The choice of deck layout is very much a personal affair. 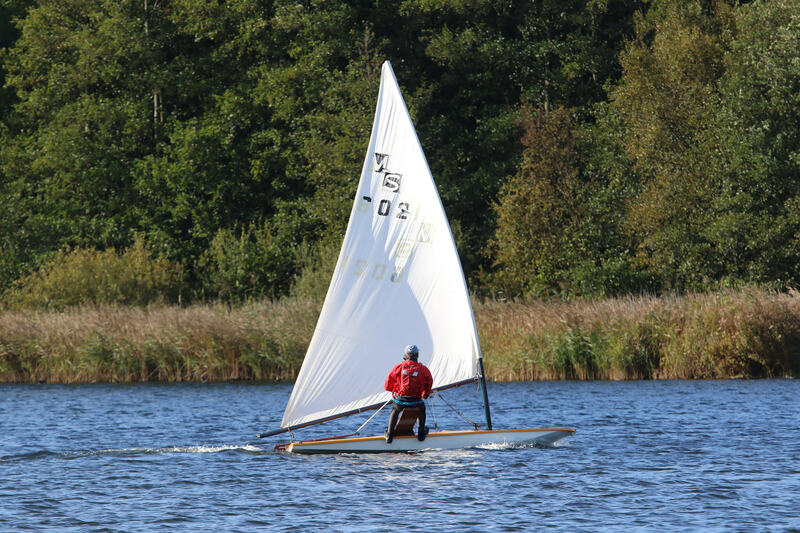 One who sails on sheltered inland lakes might prefer the cockpit version which in fluky conditions is more comfortable and therefore easier to control than a flush deck or self-drainer version. Medway Marathon maniacs would certainly opt for the latter, for sailing with a cockpit full of water makes the boat a little sluggish. I know the Sprint is fitted with two bailers, but why spend hours polishing the underneath of the hull then plonk two lovely water brakes under the hull? 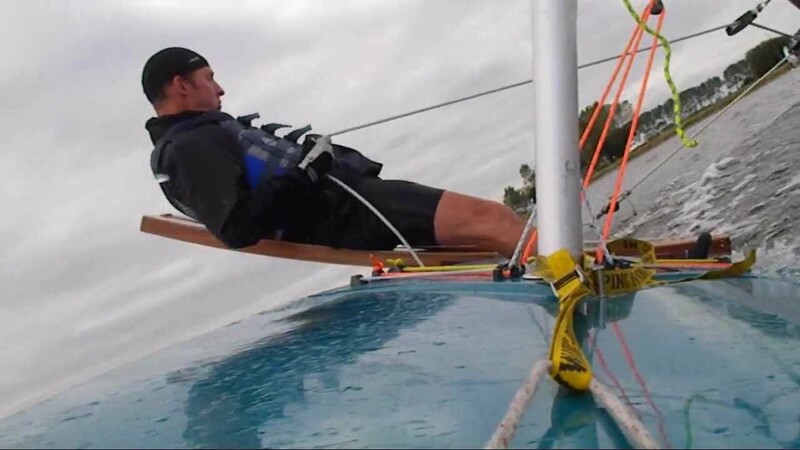 The self-draining Sprint to be produced is a very good compromise between flushdeck and cockpit and no doubt will prove to be popular with many rough weather men like myself. One word of warning to those who plan to build self-drainers, ensure you make provision for ample buoyancy in the aft end otherwise fitting the rudder while afloat may become a face mask and snorkel job. Now a word or two about rigging. 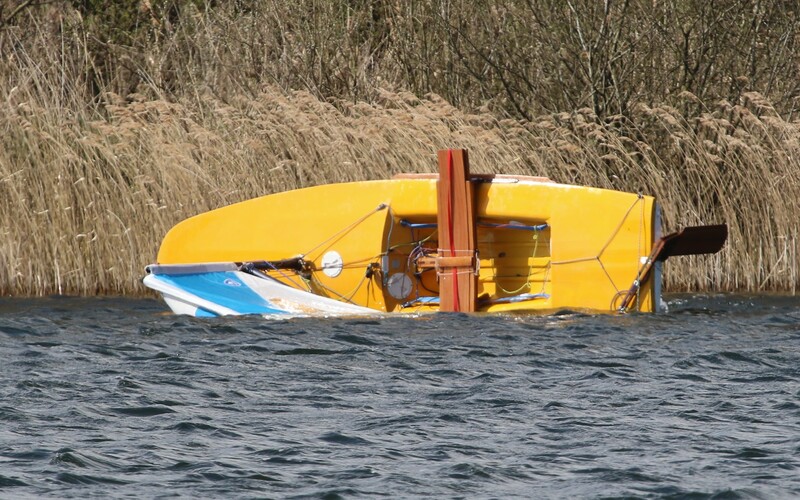 Probably the most confusing point from a layman's angle is the sheeting arrangement, whether to lasso the tiller when going about with a normal transom arrangement or to hang oneself with the centre boom affair – again very much a personal choice. Let us break it down to light and heavy weather conditions. In light fluky airs one needs to be able to go about and trim the sails quickly without losing momentum, therefore the less pulleys and purchase points the better, also a lighter mainsheet is desirable. Sheeting from the transom in light airs is in my opinion far better, it keeps the mainsheet to the rear of the boat while the helm sits up front to trim the boat so there is less chance of cutting the blood supply from his feet. 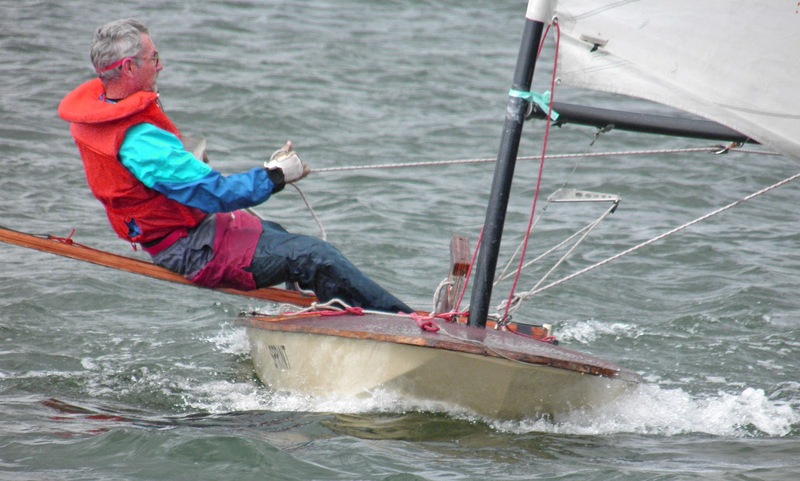 The heavy stuff requires different tactics possibly incorporating a snubbing winch à la John Burgess or swivelling mainsheet jammer like my own boat Sprinter II and Miniscus my old wooden flyer. 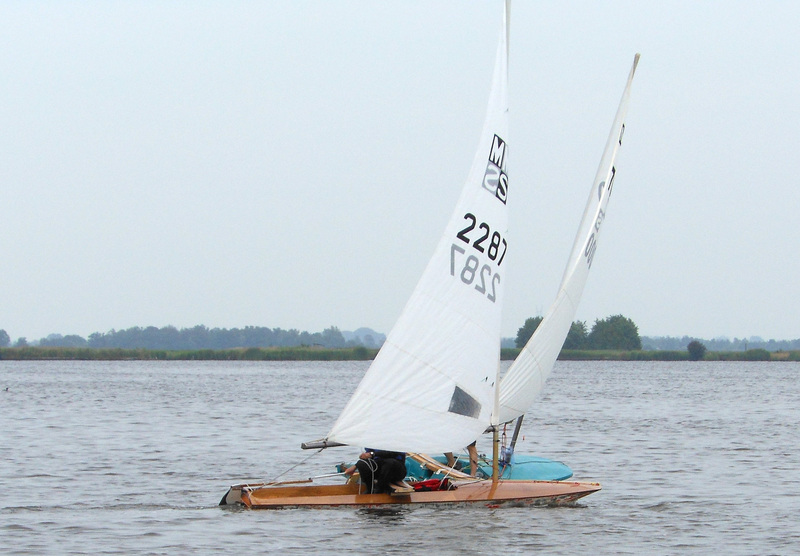 Both systems require the mainsheet to be led from the transom along the boom and down forward of the sliding seat but behind the centreboard. 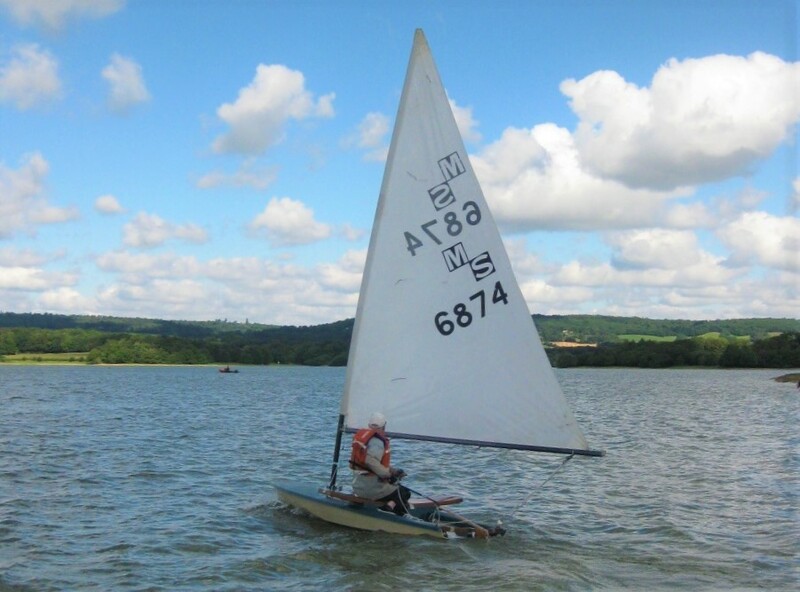 Effortless sailing can be enjoyed in force 5/6 winds with some form of jamming arrangement and is a must for those contemplating any long distance races as it frees one hand to eat food, drink beer or make rude signs at pleasure craft as you disappear under their wash. The other sail controls on the Sprint strewn across the foredeck have caused many a comment from my new Geordie friends. For example, while drifting around Sunderland harbour one day I was asked if I could play a tune on my guitar as he had not seen a musical boat before, but seriously, all three controls are necessary and the setting of them is most important if you want to stay with the top helms. 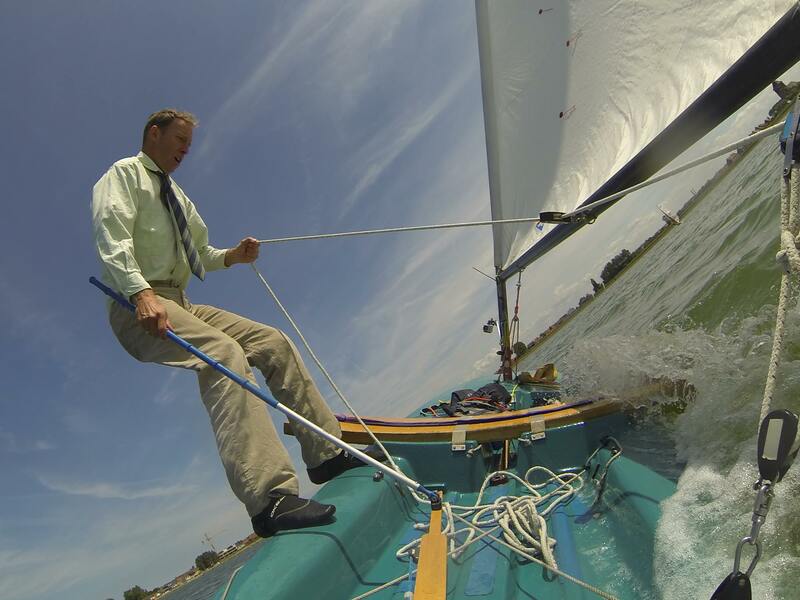 My basic theory is if you see creases in the sail try to tweak them out by adjusting one of the control wires. Try at all times to keep an equal length of rope through each cleat, there is nothing more annoying than having to reach across the boat to release, say, the kicking strap. Maybe Richmond Marine could help by supplying longer lengths as the present ones only just manage to do the job. Many of you may be wondering what is the point of a single-hander if it takes two people to rig the thing. Plenty of practice here for it is possible to thread the Sprint boom onto the sail single-handed. Still a disbeliever? Then follow my own method. First remove kicking strap and outhaul controls from the boom so the boom can be held in one hand. Now with the other hand grab the clew of the sail and thread the first two or three feet on to the boom. 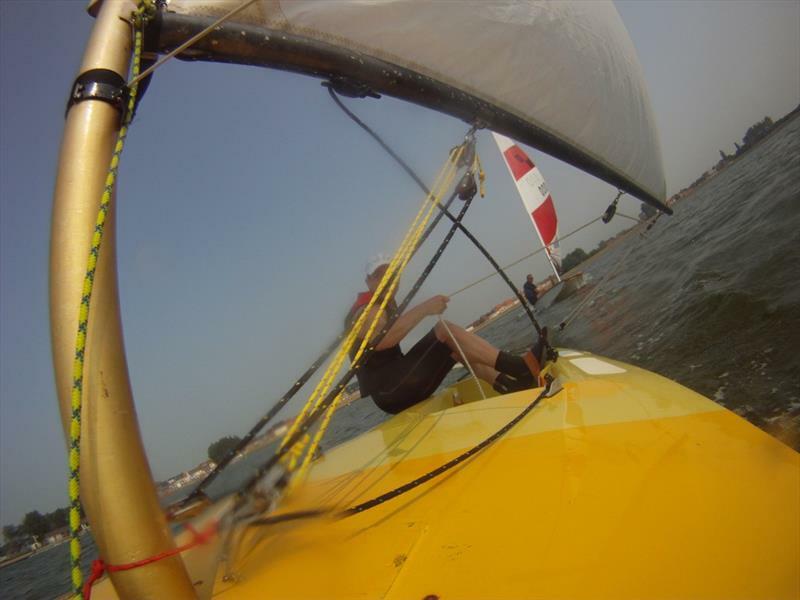 Then keeping the wind in the sail, slightly pull the foot so that the bolt rope does not flap about, then thread the boom along the sail and tie the outhaul to the clew. Should the bolt rope slip out and jam in the track, pull boom back, re-tension foot and try again. Trying to find that unwilling helper on the ten minute gun will no longer be a problem, I can nowe manage to rig the boat in a gusty force 5 with little more than a swear word or two.